I wanted to pay homage to Macho Man Randy Savage. He's one of the greatest ever and his legacy lives on forever. Today, I wanted to talk his top 5 greatest feuds in his career in both WCW and WWE. It wasn't too tough to narrow it down, just a bit tougher to get the order right. Let's get into it. -When looking back at WCW, there weren't too many highlights of Savage from a feud perspective, but the biggest one had to be Savage and DDP. Savage was somewhat infatuated with Kimberly, DDP's wife at the time and we would see that used again in a later storyline for WWE, but here Savage worked well as the creep and the aggressor in the feud. It would mean nothing as Savage got the upper hand and kept the beautiful Miss Elizabeth by his side through it all, and the mind games of Savage made this a great feud and a top 5 for me. Yes, I cheated here. I couldn't decide between these two so I just went ahead and made a tie. Savage would go on to have amazing battles against Flair, starting in WWF, but would eventually finish off their feud with a ton of back and forth throughout 1995 and 1996 in WCW before the NWO came into play. Flair usually got the upper hand, but Savage got the huge win at Wrestlemania 8 for the WWF Title, which remains their biggest contest to date. 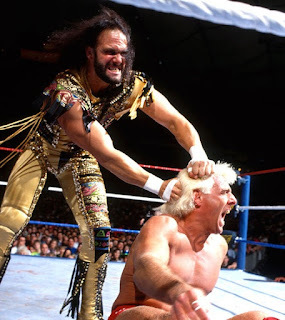 -I find it hard to include this one for a few reasons, no reason being greater than this feud was very short lived, but spawned one of the greatest wrestling matches of the 80's at Wrestlemania 3. Savage as the aggressive heel and antagonist worked perfectly, as Steamboat was the essential face that would be able to garner sympathy from the crowd, 9 times of 10. Steamboat won the IC Title and subsequently their feud, but this match and feud stands in time as legendary so it has to be on this list. -I debated putting this one at the top. It was a tough call. Jake and Savage had some really great chemistry and it only furthered the evilness of Jake The Snake and allowed Savage to finally get back in the fans' good graces. 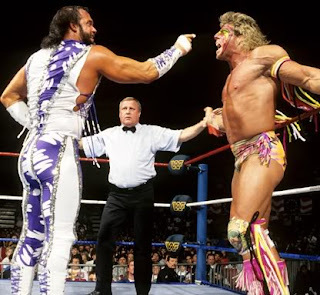 From the snake bite to the ruining of the Savage and Miss Elizabeth wedding to their multiple encounters, this was one of my favorite feuds growing up when I first began watching wrestling. There was nothing but true animosity and the feud felt just about as real as any other I had watched to this day. I always love Savage vs Jake, because not only were the promos out of this world, the whole dichotomy was something flawless. Great dynamic. -In all fairness, this would be no. 1 if they had more history together. The feud was truly epic and it spawned two classic matches (I love the Summerslam 1992 encounter as well). Their first battle, back at Wrestlemania 7 is one of the greatest WrestleMania matches of all time and possibly the greatest match in Savage's career, or certainly top 3. Warrior was never the most technically sound guy or even a great in ring performer, but with Savage leading him, they made absolute magic. I wish we could have gotten even more from these two over the years, but this feud during 1991 and 1992 was epic and deserves a slot at no. 2 and was knocking on the door of no. 1 without question. -His most hated rival. The man who seemingly held him down in a way throughout his career. Their feud and animosity never truly went away, until Savage passed away, and that let you know that the bad blood was real. Savage defeated DiBiase at Wrestlemania 4 to win the vacant WWF Title and had a pretty good run with the belt in my opinion, but Hogan was right there to steal the shine. It was a short lived title reign in some way (though it was a year long, it still felt short), as Hogan was busy shooting No Holds Barred, so when Savage held the belt, it was just building to a big moment for Hogan to steal the spotlight again. 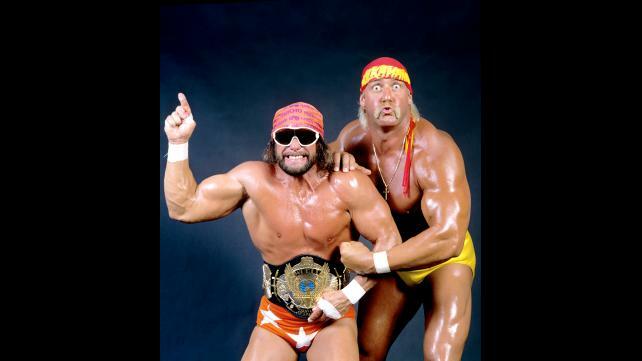 Enter Wrestlemania 5 and the breakup of the Mega Powers. Then Hogan takes the title off Savage and the feud sort of continues, but never picks up steam again. Fast forward to WCW, Hogan turns heel by dropping a leg on Savage. Their feud rekindled and lasted throughout their WCW run for the most part. Though their matches weren't as classic in part to Hogan being so limited, Savage and Hogan was the epitome of a true rivalry. Real animosity and bad blood, coupled with a number of other issues between the two men. This is definitely no. 1 on the list. Savage has had some great feuds, but these are the most important and vital in his career hands down. If you think otherwise, drop a feud in the comments below and join the conversation.